Are you familiar with loteria cards? The cards are a Mexican bingo game for children, but the cards can be used quite successfully as an oracle. Being a lunar type, I strive to follow my hunches. 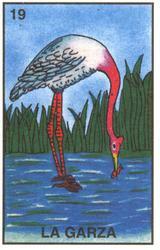 Listening to my inner urges, I pulled a loteria card this morning. The first thing I noticed about the card was its number ~ 19, a number of the Moon. (Of course I’m going to notice a lunar symbol first!) The Metonic cycle is the 19-year cycle of the Moon whereby it returns to the exact sign and phase it was in 19 years ago. It’s the basis of our lunar calendars. If you keep extensive journals, take a peek at what you wrote 19 years ago. 19 is also a number associated with the cycle of Venus. She retrogrades for 40 days every 19 months. So it is through a number that the Venus/Moon symbol intuitively clicked in. The Heron is a symbol of balance. Aha ~ Libra! Ted Andrews tells us in Animal Magic that the heron is sacred to both Athena (goddess of wisdom) and Aphrodite/Venus and carries their messages to humans. Both have proven themselves to be very wise women. Maybe Athena’s (and Venus’) message for today is not to engage in the warlike behavior of their brother (and lover), Aries, but to use patience and strategy should any type of battle arise. 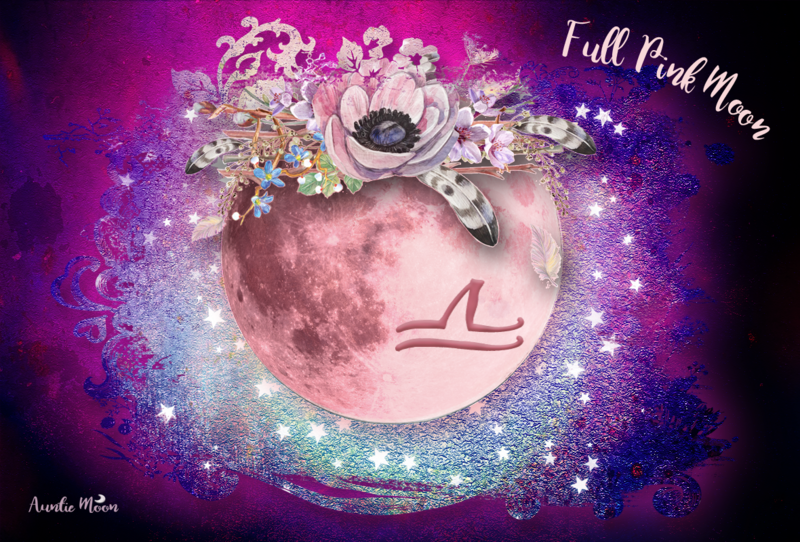 In other words, “Wade it out.” Moon in Libra seeks peace, harmony, and has a need for loving relationships. As an oracle for the day, that’s much more appealing than engaging in an emotional battle. What are your favorite lunar symbols? Scorpio Moon Trackers are now available with new astrological calendars and transits during the sign. There’s also lots of information on Scorpio and the New and Full Moons. You can even get yours personalized with transits to your natal chart and your own calendars. Check it out here. Love the Heron for Libra..! Maybe because we are so fascinated by people and relationships, the Heron’s long legs allow us to ‘wade through it all’ and fish for the parts of people that are good (which can get us hooked a bit on those that are not maybe so good for us too!). 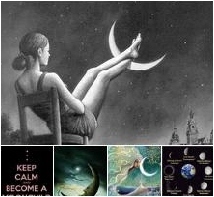 I love the Full Moon card when it comes up in a spread with my fortune Cards by Tatiana Hardy..I am always drawn to the fact that a) things will be clearer or b) a problem will come full circle and be resolved. If I get the Sun and the Full Moon..well..hey! /Balance! p.s. I am decorating and those long Heron legs would be very handy to reach the high up bits..LOL! Mmmm..Cancer Moon..makes sense!